Calcium lactate provides a nice simple soluble rich source of calcium for addition to drinking water. It is useful when known problems exist such as with species which have a particular problem. 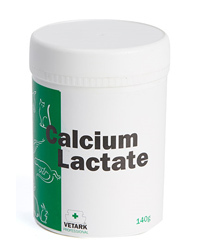 We recommend NUTROBAL or ARKVITS as a routine vitamin to provide the vitamin D3 needed to make the calcium available.